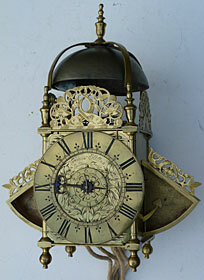 A miniature arched dial lantern clock for the Turkish Market made in the 1760s by George Clarke of London, with original verge pendulum, overall height 10 1/2 inches, dial 6 inches by 8 1/2 inches. Unrestored, but in working order. SOLD. Traditional hour-striking lantern clock with verge pendulum made about 1710 signed 'Markwick Markham London' the partnership of James Markwick (b.1662- d.1730) and his son-in-law, Robert Markham (b.c.1680-d.1741). 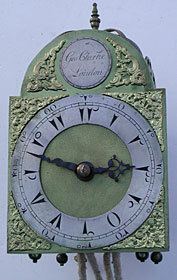 This is a Turkish market clock, which is exceptionally unusual in this traditional shape. Original alarmwork inside backplate - see article. SOLD. A fine lantern clock made about 1640 by Peter Closon, who worked 'near Holborn Bridge', London, one of the most important lantern clock makers of all time, born about 1594, apprenticed 1608 to Henry Stevens, working from 1615, died about 1660. 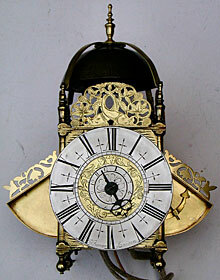 The clock was made with balance wheel regulation, converted later to anchor and long pendulum. See article. SOLD. A handsome lantern clock made in the 1690s by John Barrow of London, having a centre verge (anchor fluke) pendulum and 'wings' (sometimes called 'batswings') to the side doors. John Barrow worked from 1681 till his death in 1719. Pictured after restoration. SOLD. 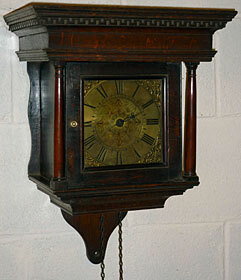 A fine lantern clock of the 1670s to 1680s by Edward Stanton of London, an excellent maker, with verge escapement, pictured after cleaning. See article about this maker. SOLD. A handsome lantern clock of the 'winged' type, having a centre verge pendulum, made in the 1670s by Francis Hill of London (born 1649, believed died 1702). This is the only clock recorded so far by this little-known maker. Superb engraving. Replaced alarmwork. Unrestored but in full working order. SOLD. A charming tiny hooded wall clock made in the 1760s by George Wood of Nailsworth in Gloucestershire, pictured before cleaning. Dial seven inches square. See article. SOLD.